EXCLUSIVE! Only Backup and Recovery Solution Designed Specifically for Windows™ BitLocker™ and Symantec (PGP™) Drive Encryption Technologies — completely eliminates the unnecessary downtime and security and compliance risks associated with other backup and recovery products. EXCLUSIVE! Safe, Secure, Fully Encrypted Backups and Recovery — ensures all of your data remains in its original encrypted state during and after the backup and recovery processes. Unlike other backup and disk imaging solutions that can create and restore only an unencrypted backup of an encrypted system drive, Casper Secure Drive Backup will create, maintain, and restore a backup that retains all of the encrypted data in its original encrypted state. With Casper Secure Drive Backup, your data is never placed in an exposed or unencrypted state. EXCLUSIVE! Complete PC Backup Protection — maintains a complete, instantly bootable backup replacement or image file backup for your encrypted Windows system drive, including the operating system, applications, personal settings, and all of your data. You have peace of mind knowing that you are prepared for any data disaster whether your drive has failed, files have become corrupted or you have regrets about that new operating system. EXCLUSIVE! Fast, Fully Updatable Encrypted Backups — creates an encrypted copy of an encrypted drive in a single step, which can be updated and maintained in the same amount of time required by other backup and drive imaging solutions to perform a partial or incremental unencrypted backup. Other backup and disk imaging solutions require two separate, time-consuming steps to accomplish the same goal. EXCLUSIVE! Rapid Recovery — eliminates the arduous data restoration and lengthy re-encryption steps required by other drive imaging and backup solutions. 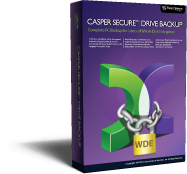 In the event of a hard disk failure, a bootable backup created by Casper Secure Drive Backup can be used as an immediate and permanent replacement for the failed hard disk or restored to a new drive in a single step. Casper Secure Drive Backup can even produce a backup of an encrypted Windows system drive that can boot and run directly from an external USB drive. EXCLUSIVE! Effortless Restoration — provides easy, one-step support for restoring a failed Windows system drive from a backup. Casper Secure Drive Backup automatically locates available backups, you choose which backup to restore, and Casper Secure does the rest. Casper Secure will even seek out your backups from multiple locations. EXCLUSIVE! Ensures Compliance with Existing Security Directives — since all data is backed up in its original encrypted state, there are no new passwords to manage, and more importantly, there are no new security protocols or encryption technologies to vet. With Casper Secure, the backup is guaranteed to be as secure as the original. EXCLUSIVE! Absolute Confidence — makes a bootable backup of a Windows system drive that can be tested immediately after its creation by simply configuring the computer to boot from it — completely eliminating any worry about the integrity of the backup. And Automatic Copy Verification ensures a Casper Secure backup has not been compromised during the imaging process by faulty RAM, a defective cable, failing disk or bad controller interface. EXCLUSIVE! Easy Upgrades — quickly duplicates an encrypted drive to another drive without requiring a laborious, time consuming and unsecure backup, restore, and re-encryption process. Casper Secure Drive Backup makes it extraordinarily easy to safely and securely replace your encrypted system drive with a larger hard drive for increased capacity or with a faster Solid State Drive (SSD) for improved system performance. Simple to Use — innovative technologies such as 1-Click SmartStart™ and SmartRestore™ make creating, maintaining, and restoring backups easier than ever.